Technically, it’s true. 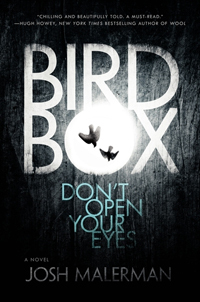 But it’s difficult to call Josh Malerman’s Bird Box a debut novel. On one hand, crowds have heard Malerman’s yarns before—just in condensed, three-minute bursts from his band, The High Strung. Born out of Detroit in the late ’90s, the band would go on to release a prolific stream of albums through 2014. If you’ve watched the Showtime series Shameless, you’ve already heard Malerman’s voice—as well as his melodically inclined buds, drummer Derek Berk, bassist Chad Stocker and guitarist Stephen Palmer. But the main reason it’s so weird to call Bird Box Malerman’s first book is because, somewhere in his Southeast Michigan home, there’s a pile of 20-something novel drafts. And that shows in Malerman’s fiction. This debut novel, released last year on Harper Collins’ Ecco imprint, is terrifying. That’s not an easy accomplishment with certain modern tastes, especially with Saw or Paranormal Activity films that define horror by jump-scares and gross-out tactics. But Malerman’s Bird Box relies on the opposite, delving deep into the reader’s imagination. In Bird Box, there’s a thing lurking the streets of the U.S. People go into homicidal, self-destructive fits when they see this thing—animal, beast, human, a vision of the infinite. And one mother, Mallory, spends the length of Bird Box’s 200-some pages trying to navigate this changed world—one where leaving the house requires a blindfold. One where sight itself can end your life. Malerman’s Bird Box doesn’t read like an author finding his voice. The talent within has arrived fully formed—a sentiment echoed in Bird Box’s critical praise, Malerman’s own Bram Stoker award and, recently, a movie option by Universal Studios. But that’s all thanks to the however-many books beneath Bird Box in Malerman’s stack of drafts, which he assures is growing by the day. His output isn’t manic, it’s not compulsive, he says. It’s simply what he does. When considering reinvention, music is the unexpected success story of Josh Malerman. In that aforementioned list of art forms, writing was what struck him first. It was cultivated in elementary school and would lead him to pen his own horror fiction, bad poetry, then “bad dark poetry,” as he’d tell you. But once writing became a craft he developed on a daily basis, Malerman hit a rough patch. He spent 10 years writing—and subsequently abandoning—novels. In his early 20s, he’d write 100 pages. Two-hundred. A draft might have 300 pages of Malerman’s rapid-fire prose, and something as simple as a bad character name, a plot twist, the words themselves, would throw him off. But in that time, “the real question for myself was, how did you end up playing music?” Malerman says. His friends—that’s the short explanation. It started with a Farfisa organ, bought from the same music shop that sold the band its first four-track. In Malerman’s early 20s, his friends taught him some chords. They asked him to sing some of those “crappy poems.” The rest is road-worn history: The High Strung evolved into its own entity—one that crossed the country countless times. A budding new voice developed within the band’s catalog, and they’d fill that 10-year gap of incomplete novels with amplifiers, crashing cymbals and state-spanning gigs. It’d be more fair to say Malerman’s role as a writer was shifted to that aforementioned passenger seat, which acted as Malerman’s de facto desk. It was where he attempted draft after draft in the middle of a decade spent understanding his own process. Still, the road was not exactly fertile ground for Malerman. He’d plow through pages every day, sometimes in that passenger seat, and still come to the same impossible conclusions. Unavoidable corners, bad character names—whatever. The drafts weren’t finishing themselves. And that wouldn’t change until Malerman was on the verge of 30, when The High Strung had one of its longest breaks yet. With two months off the road, Malerman found himself shacked up at his father’s house. Like the rest of his ceiling-high stack of drafts, Wendy was a horror book. But the first completed novel, completed nearly a decade ago, marked a new creative phase sparked by caffeine, determination and a little recklessness. In The High Strung’s extended break, Malerman worked from a 24-hour coffee shop near his father’s place. Its clientele wasn’t of the art-house variety, but, more conveniently, law students. The nose-to-the-books environment kept Malerman churning out words. By the end of the break, he’d also reached the end of his first draft. Now on the other side of 40, Malerman writes a first draft like he talks: Fast. He’ll churn out 4,000 words in a sitting, which is the length of this article—just multiplied by four and way spookier. It’s a skill that he’s honed not through a blind desire to publish, but through sitting at the computer, grinding out prose and honing his craft. And through his success as an author and a musician, that split-personality still exists. And that’s how Malerman’s leaving it: to promote Bird Box, Malerman created musical retellings of passages of the book with the help of his High Strung bandmates (and blindfolds, if audiences were willing to participate). And since its release, the band’s still found time for scattered shows across the metro-Detroit area—even in the midst of his rapid-fire drafts. In fact, since Bird Box, he’s thrown two or three more novels on his ever-growing stack of drafts. Book two, through Harper Collins’ Ecco imprint, is in its editing phase. For Malerman, the medium isn’t what defines him—but merely letting his own art occur. And with Bird Box, just as he’d hoped, that love has clearly transferred.